If you’re currently a carnivore, don’t try this. If you’re currently a carnivore thinking about a vegetarian path, really don’t try this. If you’re currently a lifelong vegetarian who thinks this is what Italian sausage tastes like, keep on believing. I came across this looking for a vegetarian Italian sausage to use in the cheese (queso) dip kicked recipe. While the dip can be made without any Italian sausage, the sausage adds a little texture to the dish. I was looking for a vegetarian substitute for that little extra texture, and possibly some additional flavor the Italian sausage adds. While I’ll still try to redeem this product in the dip recipe, this review is really about the sausage-less sausage itself. There were four links in the package. I figured that four was at least one link too many for my needs in the dip recipe, so I cooked one up just to see how it tasted on its own. 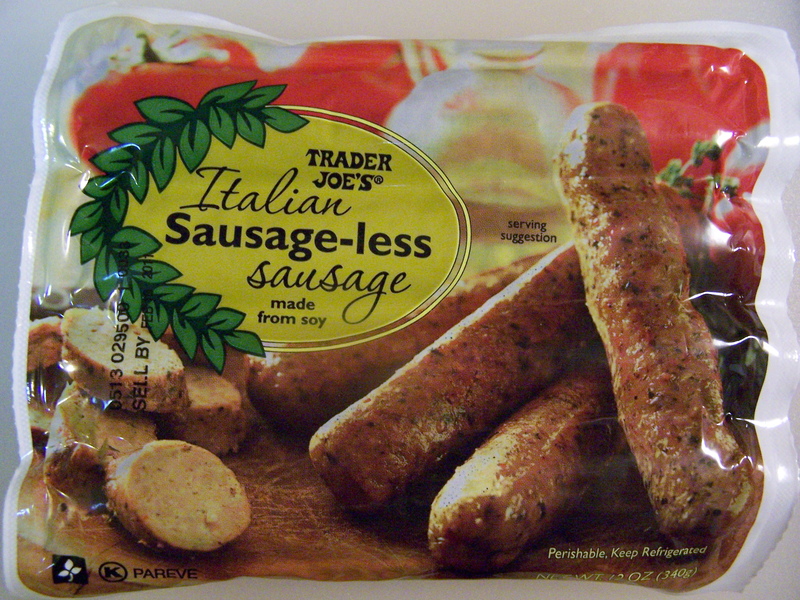 Italian-less sausage would’ve been a better name for this product. This is somewhat surprising because a whole lot of the flavor of meat-based Italian sausage comes from the non-meat ingredients. Most of the tastes of these other ingredients were missing from TJ’s sausage-less product. And, not surprising, when I read the label, those ingredients were missing from the label also. Go figure. This entry was posted on 12/25/2010 at 11:08 and is filed under Recipes, food, cooking and related items, Trader Joe's, Vegetarian. You can follow any responses to this entry through the RSS 2.0 feed. You can leave a response, or trackback from your own site.